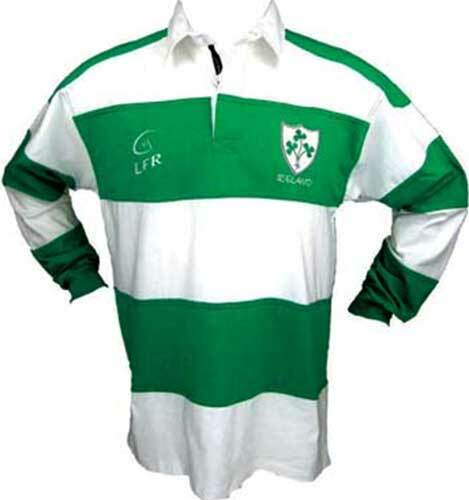 The Irish rugby shirt features the embroidered live for rugby design on the right chest and below the collar on the back. This 100% cotton Irish rugby jersey is a traditional design that features rubber safety buttons and the high-quality construction enables top durability. 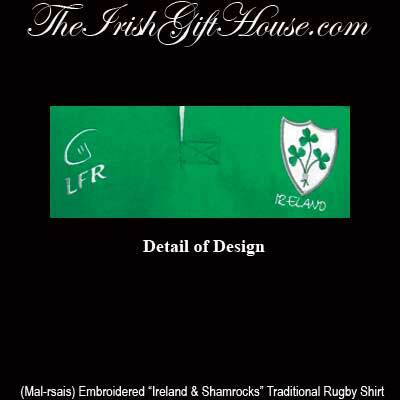 The Irish rugby shirt features an embroidered appliqué shield that is enhanced with shamrocks along with an embroidered Ireland shield. The Kelly green and white rugby shirt is available in adult sizes that range from extra small through 3XL and it is received with a shamrock history card, complements of The Irish Gift House.